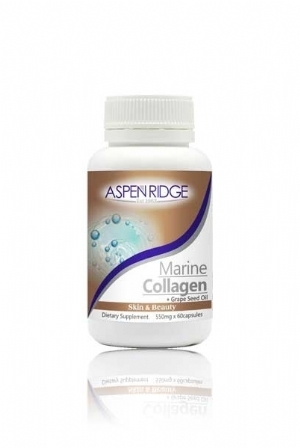 Aspen Ridge Marine Collagen is suitable for Women and mature health needs. Marine collagen provides your body with important amino acids and structural proteins that provides strength to skin, bones, joints, tendons, ligaments and blood vessels. This unique formulation contains added Grape Seed Oil extracts for a major antioxidant boost, which also benefits skin and hair health. 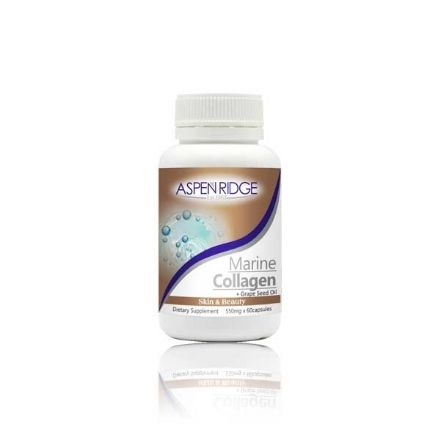 Clinical studies show Marine Collagen assist with everyday health and vitality and has superior bioavailability with regards to absorption. Collagen is a natural, odour free skin rejuvenating source, which supports the body to replenish its own collagen supply and provides nutrients that help to rebuild collagen type I and III cells and may help the effects of the aging process. Not to be taken if known allergy to seafood is present.